IBM® System Storage® N series technology enables companies to extend their virtual infrastructures to include the benefits of advanced storage virtualization. The N series offers unified storage solutions that provide industry-leading technologies in the areas of storage efficiencies, instantaneous virtual machine and datastore cloning for virtual servers and virtual desktops, and virtual data center backup and business continuance solutions. 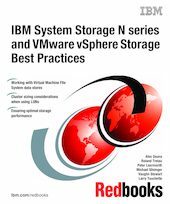 This IBM Redbooks® publication reviews the best practices for anyone who is implementing VMware® vSphere with N series unified storage arrays.